Monterey, Calif. – AASCO Motorsports’ Alex Kirby (No. 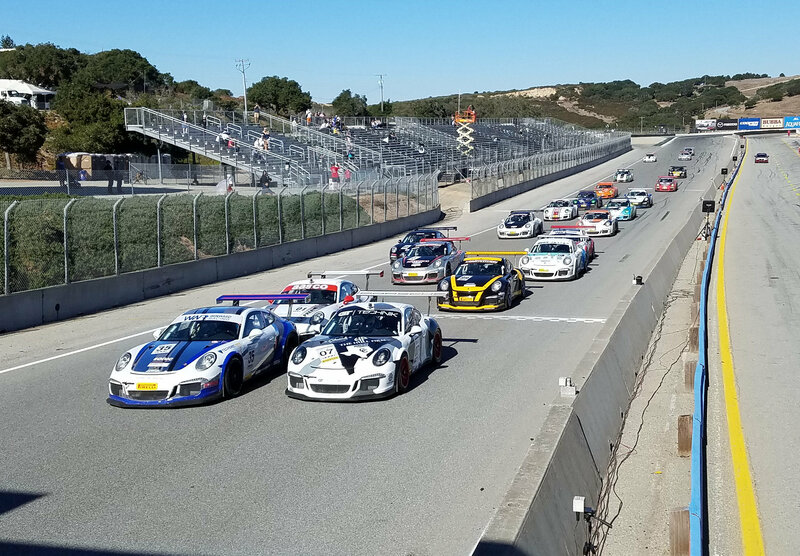 01 991 GT3 Cup) took his second victory of the season in Saturday’s Pirelli GT3 Cup Trophy USA season finale at Mazda Raceway Laguna Seca. WinWard Racing’s Russell Ward (No. 35 Porsche 991 GT3 Cup) crossed the line in first, but was penalized following the race after an opening lap tangle with Max Root (No. 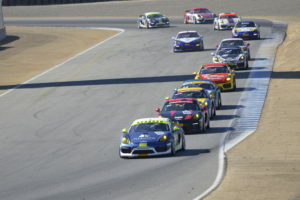 07 GT Technik Porsche 991 GT3 Cup) in the first turn. The incident saw Root spin off track and collect Diamond Masters competitors Bryce Ward (No. 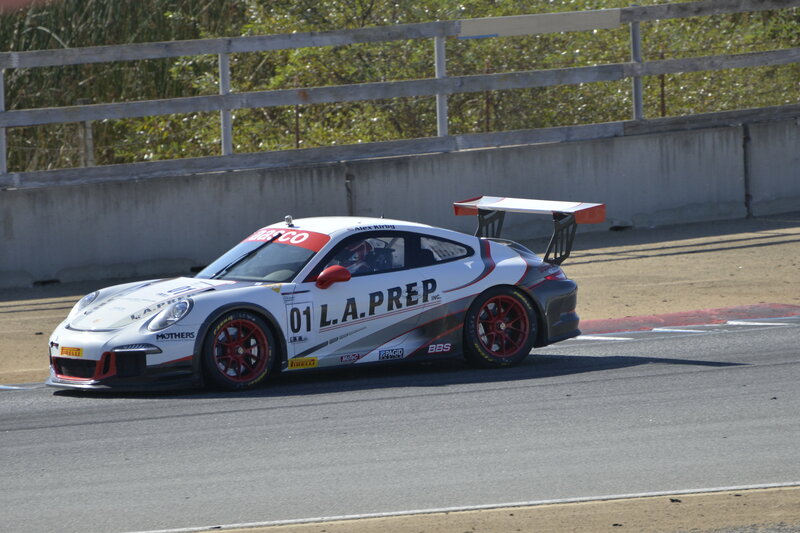 57 WinWard Racing Porsche 991 GT3 Cup) and Mike McAlister (No. 18 Competition Motorsports Porsche 991 GT3 Cup). The field took the green after two caution laps and Russell Ward began to distance himself from his competitors until a late race caution bunched the field back together for the final two laps of action. Ward held off the charging Kirby and Diamond Masters competitor Preston Calvert (No. 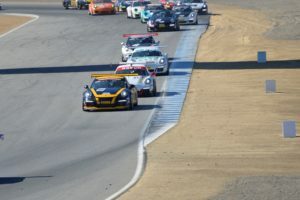 99 Competition Motorsports Porsche 997 GT3 Cup) but a 30-second penalty for avoidable contact added after the race, saw Kirby take the overall and Diamond Cup class victory in the 21-lap event. In the Diamond Masters class, polesitter Calvert was determined to recover from yesterday’s Lap 1 incident that ended his day early. He narrowly avoided the Turn 1 fracas that collected championship leader Bryce Ward, leaving Calvert to battle with Competition Motorsports’ Michael Zuieback (No. 2 Discount Tire / Competition Motorsports Porsche 991 GT3 Cup) and TruSpeed Autosport’s Will Lin (No. 8 Porsche 991 GT3 Cup). Calvert held the third position overall to take his third victory of the season. In the Platinum Class (for Porsche 911 997.2 versions), Jim Walsh – in his first weekend in the series this year – put his No. 96 Competition Motorsports Porsche on the pole position and took the win, but not without hard pressure from championship leader Ray Shahi (Sterling Collision/TruSpeed Autosport) and Shahi’s teammate Larry Schnur in the No. 32 FuelSafe Porsche. The trio swapped the lead early before Walsh took command, but Shahi retook the lead coming back from the late-race caution. 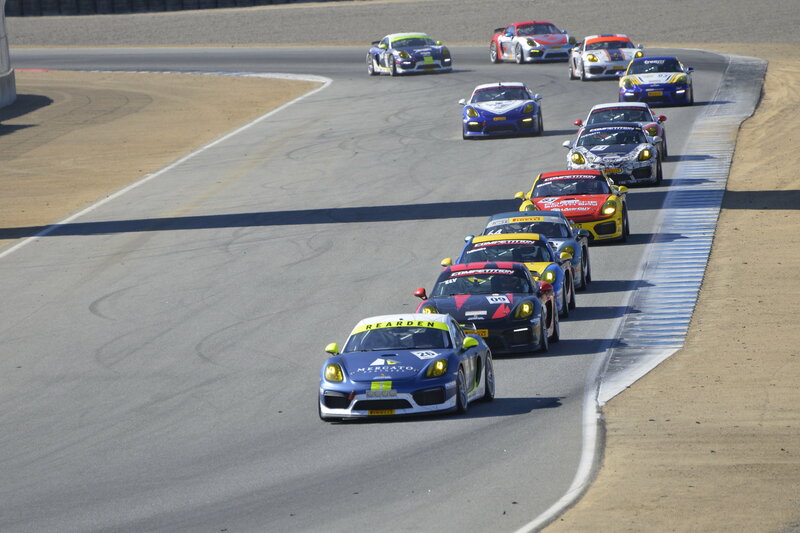 Walsh was able to get back by in Turn 11 for his first series win, as Shahi finished second and Schnur third. 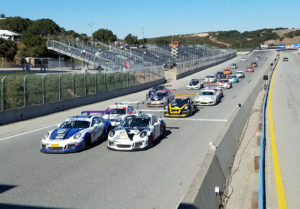 Only once in the 16-race season has the Silver class for Porsche Cayman GT4 Cup Cars not come down to a dual between Rearden Racing’s Jeff Kearl and Competition Motorsports’ Sean McAlister, and Race 16 was no different. McAlister, Friday’s race winner, took the pole for Saturday’s contest but could not hold off Kearl, who stormed past on Lap 13 for his 12th victory of the season. For the Pleasanton, California native, it was especially sweet to take the win surrounded by friends and family. In Silver Masters competition, it was a clash between master and student, as Competition Motorsports teammates Steve Goldman and Laura Ely battled for victory. Goldman took the pole position and was aiming for his 11th victory of the season, but Ely spoiled the plan, taking advantage of a rare mistake by Goldman to snag the lead. Ely kept her No. 09 Porsche Cayman GT4 Cup Car in front to take her second win of the season, with Goldman second (No. 1 Porsche Cayman GT4 Cup) and teammate Carl Tofflemire third in the No. 62 Porsche Cayman GT4 Cup for an all Competition Motorsports podium. For Competent Motorsport’s President Greg Franz, it was a fitting end to a 2017 season that has seen rising car counts and spectacular racing. This entry was posted in News on October 14, 2017 by admin.